Home / Entertainment / Animals / Video: Shark Week Is Here For All The Fin-natics! It's shark week time and that means everyone is glued to their screens watching Discovery Channel as the nation bonds over sharks (despite the fact that we will all be too terrified to swim for the next few months with looming images of our bloody shark attack). There is just something fascinating about a cvreature that could literally rip us to shreds in seconds. It's like telling a kid not to touch the stove... the curiosity will always win. It is the longest-running cable TV programming event in history and features a school of shark-related shows that will run July 22-29. Not only is everyone's TV tuned into Discovery, they are also expecting to make an excess of $18 million in related retail sales. Discovery is going bigger than ever to celebrate 30 years of shark week and are joining up with a diverse record of retailers for this year’s event, including Build-A-Bear Workshop who will be promoting two fluffy Shark Week-themed killers, a great white and a hammerhead, each with coordinated clothing options. Walmart and Vineyard Vines will stock more than 40 select Shark Week products, including neckties, headgear, and summer-themed items such as swimsuits, towels, beach totes and drinkware. Shark week fans can also expect to have their social media news feed loaded with photos and videos of the majestic creatures provided by a mix of researchers, filmmakers and conservationists. Shark week kicked off on Sunday with Alien Sharks: Greatest Hits, followed by Bear vs. Shark and Shaq Does Shark Week. If you don't have DSTV or any other similar networks, the Shark Week website page has provided a link to allow fans to live stream or even Sony's streaming service, PlayStation Vue which offers a five day free trial for the service. Although discovery had a bit of help from Steven Spielberg who sparked the shark fascination after the release of Jaws, that led to Discovery's prime time average ratings nearly doubling that week in 1988. But it didn't all start and end with Jaws. The shark classic, which still holds the record for the seventh highest grossing film of all time, made almost $500 million worldwide in box office earnings. 1999 sci-fi horror movie, Deep Blue Sea and Sharknado released in 2013 only added to the shark craze. In fact, Sharknado went viral when it first aired in 2013 and earned 318,232 tweets on opening night – and up to 5,000 tweets per minute. But aside from the sensationalised horrors presented in the movies, Discovery boasts some of the best live shark footage in the world and even has a robot-sub fitted with six cameras that filmed great white sharks off the coast of Mexico’s Guadalupe Island in the 2014 show Jaws Strikes Back. Shark week host, Gelder, a former Australian army paratrooper, has already lost two limbs due to his daring shark encounters, even admitting “We risk our lives to make things.” Gelder will spend 48 hours in shark-infested waters with no food, water or sleep for this year’s Shark Week. Although he may be willing to dive into danger, he has said that the main reason he participates in Shark Week is to teach the audience to respect and protect the animals that a lot of people fear enough to kill. Cheers to Discovery and all you fin-atics out there! Video: You're Not Embracing The Culture, You Just Sound Stupid! Video: Watch This Baby Shark Emerge From Its Egg! Video: Never Swimming Again! ' Intense Footage Of A Bull Shark In North Queensland, Australia, Rushing And Attacking A Spearfisherman Mid Dive! 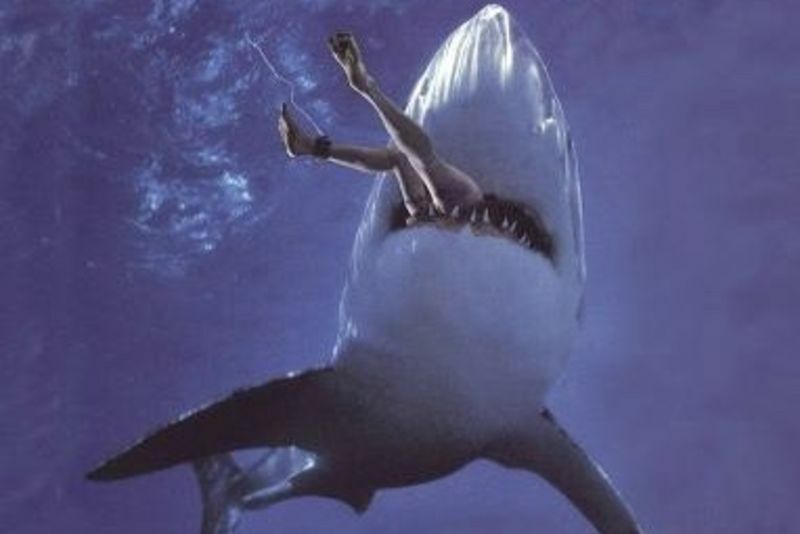 Video: 5 Horrific Shark Attacks Caught On Tape!